We arrived in Cyprus on Thursday afternoon. Most of us were in Cyprus for the first time. After checking into our hotel, we went to Girne (Kyrenia) with Suna and Ilgaz for some sightseeing and dinner. Friday was for registration, pre-race briefing and some relaxing time around the pool. This was a point to point race and our hotel was close to the finish. 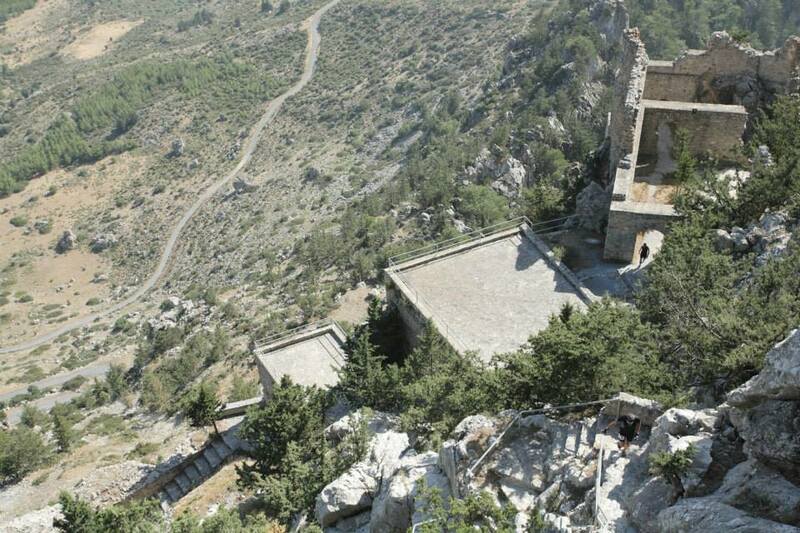 So a bus would take us at 3am on Saturday morning from our hotel and drive us to the Kantara castle for the 5am start. After an early dinner we went to bed at 10pm and got up at 2:15am. 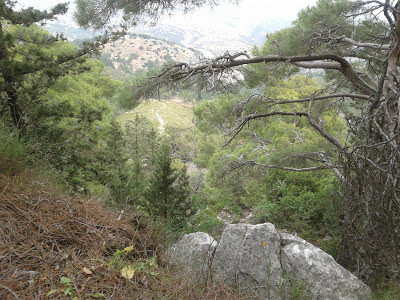 A small nap in the bus and we were at the base of the Kantara castle after an hour's drive. It was quite windy up there but it wasn't a concern for me. I actually loved it. We were a small but energetic crowd at the start line. We wished each other luck and the race started just a few minutes before 5am. It was still dark but the full moon was bright enough to light up the road ahead. The first few kilometers were mostly downhill with little climbs in between so it was a fast start. The race starts from the east and goes to west. Elevation Graph for the 80K. Garmin says +2700m. Google Earth says +3060m. I say "it's not flat`. As always Ilgaz created a great checkpoint table for us. It started to get light after about 10 minutes and a lead group of five was formed. Other than me three of my friends were also there: Caner Odabasoglu, Mustafa Ucbilek and the women’s favorite Elena Polyakova. A few kilometers later Elena thought the pace was a bit too fast and wisely decided to fall back. I was not surprised. She's always a smart runner, maintains the same pace throughout the race and if you blow up later on in the race she suddenly pops up in your rear view mirror! The fifth runner in the front group was David who had won the race last year. None of us had actually run the course except for David. We were told by the race directors Bryan and Chris that the route was marked with red dots on rocks. I didn't know what to expect but I sure didn't want to get lost at the beginning. So my plan was to try to stick to David for some time and get a feel for the course markings. But I was also concerned about starting out too fast as this was my third ultra in the past 35 days and I did not know how my body and legs would respond. As soon as we reached some hilly sections it quickly became clear that chasing David would be quite hard because he was very strong on the uphill sections. 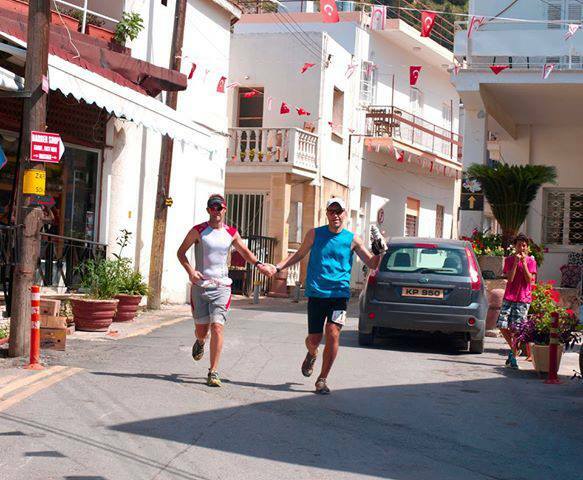 When we reached the first checkpoint (10K) David was 30 meters ahead of me and he continued without stopping. I got some water and biscuits and found myself about 70-80 meters behind him. After the CP there was a long gradual climb where Caner started to fall behind and I lost sight of him. I continued to follow David from a distance up until the 20K point but eventually he also got out of sight. We were running at quite a fast pace but I thought I could sustain it for most of the race. By now, I was comfortable with following the markings and decided to run my own race rather than forcing myself too much this early. 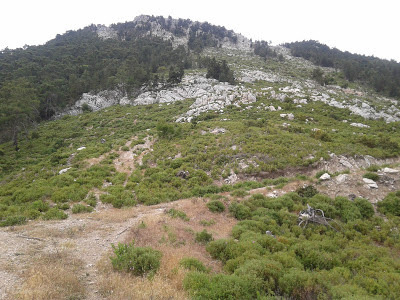 After CP2 (22K) we reached the first single track of the day. I had to slow down quite a bit here because the trail was twisting and turning quite a lot. When you’re running fast and you don’t know the course it was quite easy to miss a red dot and end up on the wrong single trail. I had a couple of small mishaps here but in the end it wasn't that bad and I managed to reach the short section of tarmac road that would take us to CP3 (29K). This should be just after CP1 I guess. David going strong on the uphills. I'm a little behind in red. Caner is also behind me. I had some oranges and electrolytes at the aid station. Even though it wasn't even 8am the weather was getting very warm by now. This was the lowest point of the course in terms of elevation and there was no wind at all. The volunteers on this CP were great like all others. One of them asked me how it was going. I told her that everything was good so far. We were told before the race that it was relatively easy until CP3 and then it would get harder and harder until the end. So, I knew this was just the appetizer before the main dish. When I was ready to leave one of the volunteers ran with me for about 100 meters to show the trail that I should follow. I thanked her and started climbing up a long steep hill. First it was a single track then it became a jeep track with some great views which reminded me of parts of the Lycian Way. Alternating between running and fast hiking on the hilly parts I passed the 40K point which was painted in red on a rock. I congratulated myself for getting through the first part and soon after I reached CP4 (43K) where I had some potato chips and coke. After that my focus was getting to CP5 where I would have a chance to access my dropbag. I knew that just before CP5 I was going to face one of the toughest climbs of the course called the Heartbreak Hill. I was still able to run quite hard without exhausting myself in this section which gave me some confidence that I could finish the race without a major blow up. And there were some great views on both sides of the trail which really lifted my spirits. When approaching the 50K mark the route turned left from the jeep track and headed down to the rocky trails below. I sensed that the “easy” stuff was coming to an end. After running alongside a dry river bed I faced the infamous Heartbreak Hill. Looking at the hill from below I thought it lived up to his name. As I was slowly crawling up the steep hill I couldn't wait to change my shoes at the 53K aid station. Up until that point my New Balance 890s were almost perfect for most of the way except for the small rocky sections and some twisting single track. But now I was sliding all over the mountain and feeling the rocks beneath my feet. It felt like it took me forever to cover that small section and as I reached CP5 I was convinced that I was way behind David. But to my surprise Bryan and Chris told me that David had just left the CP a few moments ago. I found my dropbag and quickly changed my shirt, grabbed a few gels and a second water bottle, switched to my trusty Montrail Mountain Masochists, ate a few things and poured some water on my head. Even though I tried to be as quick as possible somehow it still took me 5 minutes but I didn't care. I knew I needed to take care of myself before the toughest parts of the course. Bryan and Chris did a great job of motivating me there. Chris also told me that this next section was not so bad but once again warned me about the difficulty of CP6 to CP7. As I was leaving the station I remembered Bryan’s words at the pre-race briefing. “You should think of this course in two parts. The first half is the first 53K, the second half is the last 27K. Both parts will probably take the same amount of time to cover”. I had reached this point in about 5 hours and 15 minutes. I wasn't quite sure what to expect from the remaining 27K but having seen that the first 53K had not been easy I knew for sure that something really challenging was waiting for me. For the next 2-3 kilometers I was feeling quite good but at the same time I was very sloppy with my gear, and had to stop a few times to adjust some stuff. When I reached a rocky single trail I spotted David 50 meters ahead using poles but moving really slowly. I was really surprised to see him because I thought I wasn't moving that fast. As I caught him he moved to the side and let me pass. He didn't look fine so I asked if he’s OK or needed anything and offered some water. He said he was dehydrated. I offered water a second time but he said he had just had some and that he needed some time to recover. I said OK and moved on. He had told me after the race that he had fainted for a few seconds and fell to the ground a few minutes after I left. The poles probably had saved him from a serious injury because the rocks at that section were really unforgiving. So, unaware of what had happened to David behind me I continued running pretty well up until the 60K mark. Now I was very close to CP6 but in order to reach it I had to climb a steep and rocky hill with no trail present. As I was nearing the top of the hill, I mentally prepared myself for the next section ahead. Chris had told me at CP5 that this section was quite good until CP6. Well, if this is what she considers “good” I wondered what “bad” would be. I also knew I had to use this aid station really well to revitalize myself. On the last meters of this tough climb a photographer was waiting. She kindly asked me if I could smile a little bit. Obviously I was in no mood to smile but the fact that someone asked me to smile when I was feeling completely exhausted made me smile. I don’t know how that photo turned out but I’m quite sure I was looking horrible! When I finally reached CP6 (62K) I poured water onto my head, drank a ridiculous amount of water and coke, got some electrolytes, ate some stuff which I don’t quite remember and headed out. I knew that this was going to be the make or break section of the race. One of the volunteers kindly ran with me for about 50 meters to show the trailhead. I thanked her and started running up the single track. It was really tough to run on that ground and I had trouble concentrating on both the markers and my footing at the same time. After about 15 minutes it became really hard to spot any trail at all. Hopping through the rocks, I realized that I had lost sight of the red dots. Up until that point when I had lost the markings I was smart enough to go back and look carefully from the last red dot I had seen. By doing that it never took me more than a minute or two to find the right way. But this time it was incredibly hot and I was really reluctant to go back on this grueling terrain so I started jumping around the rocks in the hope of seeing a red dot ahead. Nothing. Everywhere looked the same. It took me some time but I finally accepted the fact that I was digging a bigger hole for myself and decided to turn back and find the last red dot. The problem was I couldn't find where I had come from because I couldn't see any trail. 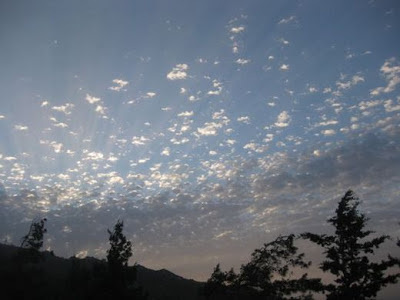 Once again everywhere looked the same. Before the race I had joked with my friends that if we got seriously lost we could end up in Southern Cyprus. That joke was not funny anymore! I could even see the news headlines: “CONFUSED RUNNER CREATES INTERNATIONAL CONFLICT”. Tracing back my steps I finally saw something resembling a trail and then spotted a red dot. I went slowly, very slowly from there and eventually managed to find the right way. After that point I became really paranoid and constantly told myself to go slow and make sure to find the red dots. I still had some energy left but it was very frustrating not to be able to use it because of the rocky terrain and navigational concerns. 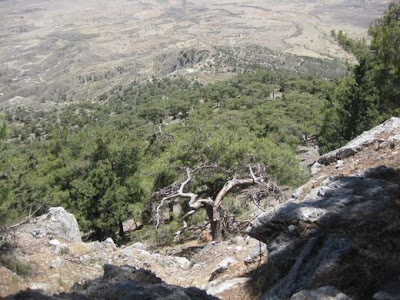 In the end, it seemed to take me forever to climb to the top of the mountain. At that time I finally understood what Bryan and Chris had meant when they said this 9K section could take more than two hours for most people. In this section I also experienced a new feeling. I had broken my left arm in January. Back then one of my biggest concerns was how it would effect my psychology. What would it be like running fast on downhills and technical terrain? Would I be too scared to run fast? Would I lose all my confidence on technical sections? Well, since the accident I have completed two trail ultras, had a marathon PB and ran some fast short trail races but never thought about falling and breaking it again. In this section, however, I was really concerned and thought about it for a few times because falling would definitely mean breaking something. So, back to the race. At some point near the top I saw David approaching me from behind. I was not surprised because I knew I was moving very cautiously on the rocky and steep terrain while trying to follow the red dots. Since he knew the course quite well I let him lead the way and just followed on. It felt good to take my mind off the markings for a change. There were 3-4k to go until CP7 (72K) and by now the heat was extreme. At some point we stepped over the dead body of small dog which most probably died from dehydration. As I took a sip from my water bottle I was thankful that I was still feeling quite good this late in the race. But that wasn't the case for David. Running behind him, I noticed that he was again having a really tough time. 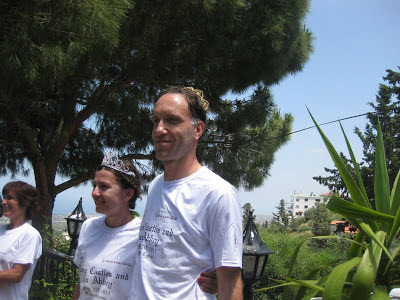 We were now approaching the Buffavento castle and it was announced before the race that the first man and woman to the top would be crowned as the King and Queen of the castle. I didn't want to race to the top with him being in this condition so offered to climb the castle together. He said it would be great but that he needed to rest for 5 minutes at the station first. To be honest, I didn’t want to stop but as long as it was five minutes I said it’s OK.
At the aid station David sat down looking really terrible. (After the race he told me that he probably suffered a heat stroke). I helped a volunteer to fill his bottles, and then gave him some coke and water. After five minutes I turned my back and to my surprise I saw him lying down. It definitely looked like he needed more time to recover so I decided not to force him anymore in this condition. But I also knew that I had to climb up when I was still feeling good so asked him if it’s OK if I went alone. 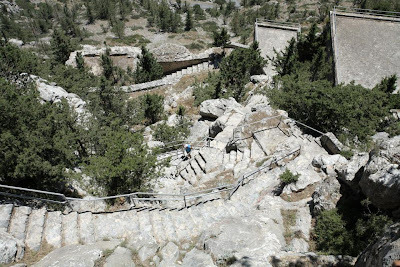 He said sure and I started the long climb up to the Buffavento Castle. Buffavento means “defier of the winds” in Italian. It was built in the 11th century and located in a very strategic location. It was also used as a prison at some point. It sounded quite simple when I was reading the course notes before the race. 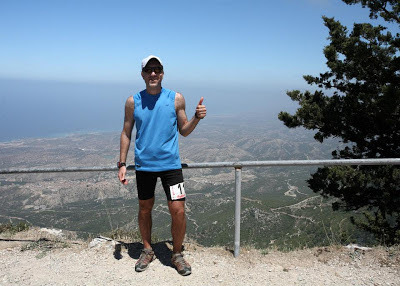 Just climb up to the castle and have your photo taken by a photographer who will be waiting for you at the top, go down the same way to the aid station and start for the last section. Since we were allowed to leave our materials at the station I didn't take any water with me thinking that I wouldn’t need it. When I climbed a third of the way, however, I was already regretting that decision. There was no wind on that side of the castle and it was like a furnace out there. This climb turned out to be a surprisingly tough one as the stone road and stairs seemed to go on forever. According to my Garmin data the climb starts from an elevation of 727m and goes up to 961m in just 1.3 kilometers. As I was going up the stairs I tried to think about the men who had built that castle almost one thousand years ago. I’m sure they were not whining a lot so why should I? As I was approaching the top I thought for a moment that there was no one up there. So I shouted that I was coming up and if anybody was there. Kagan, the photographer, replied and I saw him at the top. It was still a long way to go. When I finally reached the top the view was absolutely outstanding. Kagan took a great picture and offered me some much needed water. I thanked him for waiting for us all day long and headed down. A few minutes later I saw David going up and we motivated each other. I was glad to see that he had recovered. Also, when I was going up I remembered a stair climbing contest that I had entered last year in Istanbul in one of the highest buildings in Europe which has 54 floors and 1200 steps. That race took me about 10 minutes to the top and looking at my data the climb to the castle took me about 18 minutes. Sure, one of them was on fresh legs but I ran all the way from the top of the castle to the ground and it still took me about 9-10 minutes. That tells me it’s a seriously tough climb especially at the 72K mark of the race under the scorching sun. I started the last section feeling good. Somehow I thought I read in the course description that the last section was all downhill on jeep tracks. Wrong! Looks like I totally missed the part where it says “The end is around the corner but don't be lulled into complacency yet, there is a tough section to get through before you can relax and glide down to the end. 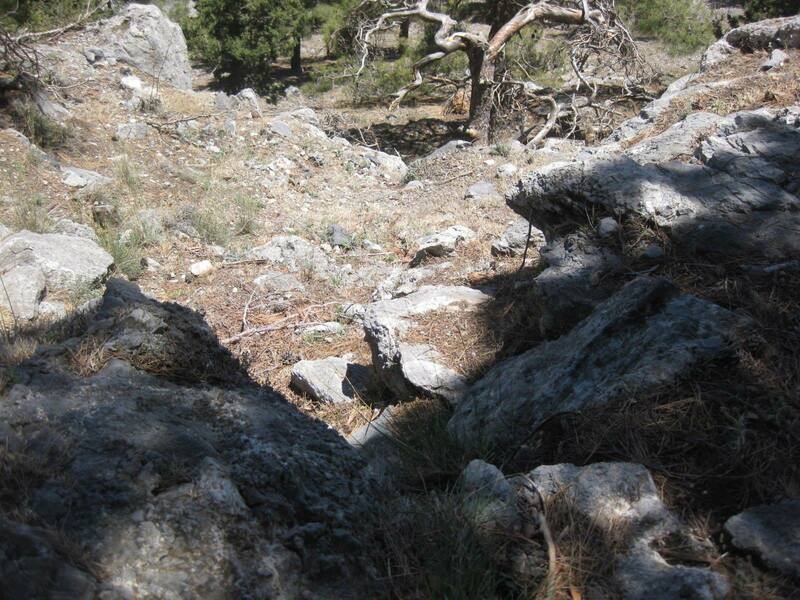 The first 3km is on really rocky trail before you hit easy running jeep track”.`That description is perfectly right. The first 3K is very rocky and I thought it would be stupid to take unnecessary risks with tired legs. When I reached the single trail section I missed a right turn which cost me a few minutes. When I started to descend from the hill I heard David behind telling me that I was going the wrong way. But this time I was sure that I was right because I was seeing the red dots. I think that section was a bit different from last year, so I told him to just follow me. To be honest you never want to be caught in the last bits of a race. But in this case, I was not disappointed at all. I was genuinely glad that he had recovered and caught up. I race David to the finish and he beats me: Possible. He came back from the dead a couple of times and seemed to have recovered quite well. You should never underestimate the heart of a previous champion. And he was wearing Hokas which are great for bombing the downhills! Did I want this to happen? No. I race David to the finish and beat him: Possible. I was 60 to 90 seconds ahead. Definitely tired but didn't have a major problem. I love running the smooth downhills pretty hard if I need to and thanks to my Mountain Masochists my feet were in great condition despite the rocky terrain. Did I want this to happen? For some reason, I couldn't say yes. It just didn't seem right. What if we finish together as joint winners? Was such a thing even possible? What would he think of that? Would it be stupid to even ask? I did not have the answers to those questions. Did I want this to happen? Definitely yes. It just felt perfectly right. So, just like that I listened to my gut, stopped and turned back. For a few moments there was nobody behind but after some seconds I saw him coming round the corner. I waited for him to catch up and we ran together for a few minutes without talking much. I’m sure he was thinking of the same possibilities, too! I finally broke the silence and said, “You know, if you wanna finish together, it's OK with me!”. If the answer was anything but yes I was ready to sprint but thankfully he said “that would be really cool.’ And in that moment a deal was made and we could finally relax a little bit. But of course we couldn't relax too much because David told me he saw Elena going up the castle when he was going down. Knowing how strong Elena is at the end of races I wasn't surprised at all. And later we also found out that she was running extra hard because Janet (who was running her first ultra by the way!) was not far behind. 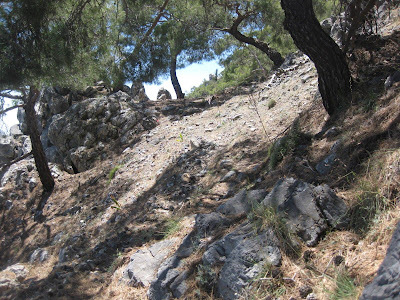 I was also expecting Caner to seriously close the gap because with his mountaineering and orienteering experience he truly excels on technical terrain like this. 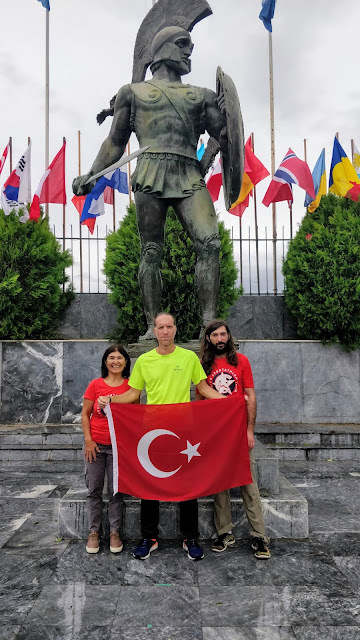 But we were lucky in that he couldn't train much in the last few months because of organizing Iznik Ultra and he didn't bring his poles thinking that he wouldn't need them. So, at that point I also asked David the distance to the finish and he said it was about 3 kilometers. It sounded very short but I wasn't going to argue with someone who ran and trained on this course. I hate to break it to you like this David but it was almost 6K after that point and that extra 3K just killed me! Haha. Anyway, after a series of neverending switchbacks we finally reached the town of Bellapais and started to run on the narrow streets. David told me that we should hold hands so that they couldn't identify a winner even if they wanted to. Well, I think to prevent this from happening again Bryan and Chris may get some HD cameras for next year and implement a photo finish system! 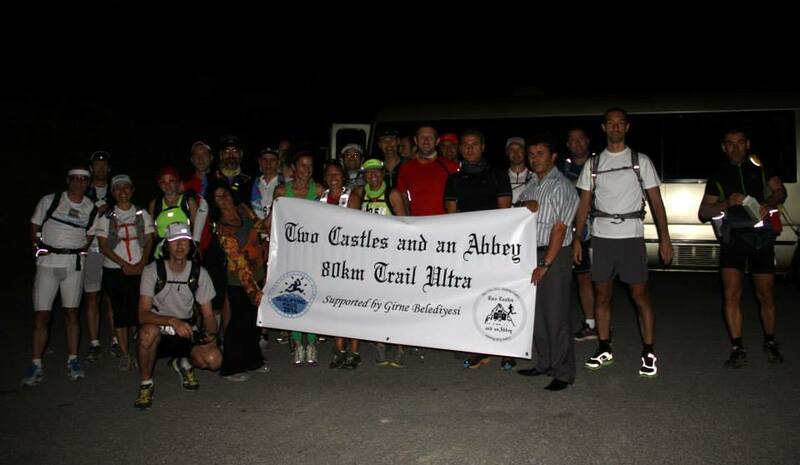 In the end we finished together in front of the Bellapais Abbey in 10 hours and 6 minutes. It was a very special finish which completely satisfied me and one that I will remember for a long time. 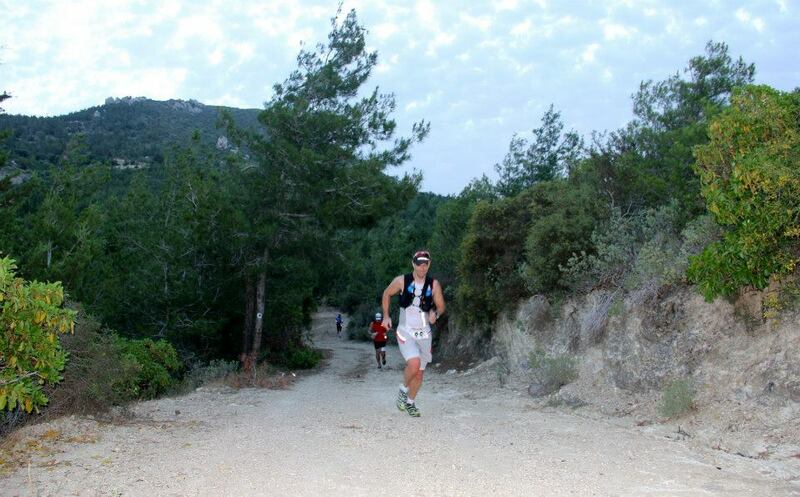 For me, the beauty of ultrarunning is that you start a race knowing nothing about the guy running next to you. Then after spending long hours on the same trails and enduring the same hardships, you end up finishing the race as if you know him all your life. Having seen David in that condition I was amazed how resilient and strong he was at the end. He surely deserved it as much as me and I feel honored to have finished together with him. A few minutes after the finish. We're having a laugh with David while Evren is making sure that we're OK.
From left: Ilgaz, Mustafa, Aykut, Suna, Elena and Caner. I want to thank Bryan and Chris for organizing this race with very limited resources. It’s not a huge event (doesn't have to be) but definitely true to the spirit of ultrarunning which is why we do this in the first place. We could all see that everybody was putting their heart and soul into this race. 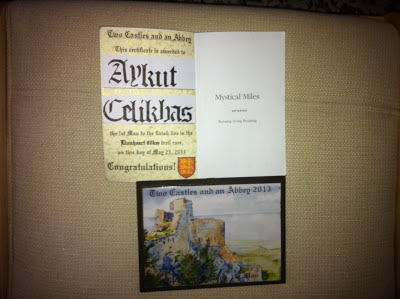 I want to say that I loved the handmade painting and the King/Queen of the Castle prize was a very nice touch. I also started reading the book and I like it a lot. Thanks for not giving one of the more popular books. I thought I knew almost all of the ultrarunning books but I wasn’t aware of this one from a South African runner. I’m sure this race will get better with each year. There’s always something to improve and I’ll definitely try to provide some suggestions as I gather my thoughts. Thanks to Devrim, Colin, Robyn, our great photographer Kagan and all the organizing team. Also thanks to my friends from Turkey I had a great time before and after the race. My special thank you prize should go to Devrim’s sister Evren who took David and me in her car after the finish and gave us a ride to our hotel when even the taxi drivers were not accepting two wet, sweaty and smelly guys in their cars! Last but not least, thanks to all the wonderful volunteers who did a great job at the aid stations. Like I always say, there’s no race without you guys. Congrats to all the Lionheart runners for having the courage to try a challenging course like this. 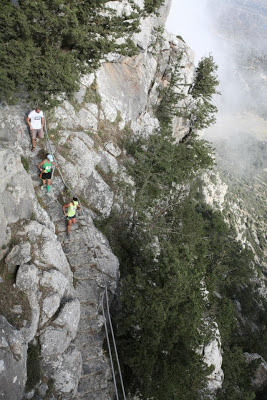 I also believe the Mountain Goat (9K) and the Braveheart (27K) runners should get more credit because they definitely ran some of the toughest parts of the course. It definitely wasn't a walk in the park! The cut-offs may look generous at first but you still have to move fast in the first 50K because no matter who you are you’ll slow down quite a bit in the last 30K. When doing your calculations keep in mind that this race has about 3000 meters of climbing, it's very hot out there and you can't always run on some sections even if you have the energy..
On the contrary, you can be fast in the first half but you have to be prepared both mentally and physically for the technical terrain in the second part. You need to be extremely careful with your liquid and electrolyte intake, especially in the second half. This is more important if you’re not used to running in this kind of heat. You have the option of putting three dropbags at CP3, CP5 and CP7. You have to plan them wisely. For example, I thought before the race that leaving a dropbag at CP7 (72K) was quite meaningless but having seen the climb up to the Buffavento Castle and the first half of the last section, I can now understand that it can make a big difference. Depending on your preference and experience you can get by with a road or more minimal kind of shoe in the first half but unless you’re a member of the Tarahumara tribe you’ll need a solid trail shoe for the rocky and uneven terrain in the second part. When climbing up to the castle I didn't take any water with me. That was a mistake. Take some water. You’ll need it. And try to enjoy the climb up the castle as much as you can. It is brutal but at the same time it is magical and that’s something I’ll always remember. Miserable is memorable! Finally, you have to listen to what Bryan and Chris tell you because they provide some great tips and they definitely know what they’re talking about. The book (Mystical Miles by Paul Vorwerk) and the painting. I should have been sharing these with David but I was told that he would receive a copy of these later since he lives in Cyprus. Note about photos: You'll notice that some of the photos don't have credits. That's because I couldn't find the name of the photographer. If you're the photographer or you know who took them please let me know and I'll be glad to give credit.